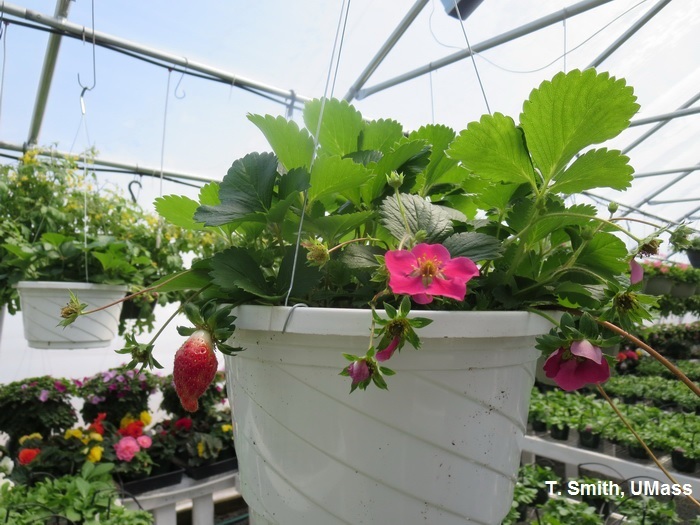 Links to information on greenhouse strawberry production for: Potted ornamental plant production (retail home garden market); plug production for field and high tunnels; and greenhouse production for fruit. Strawberry Berri Basket. (Culture guidelines for ornamental potted baskets for retail sales). Ball Seed. Strawberry Plug Plant Production pdf (for establishing plantings in field or in high tunnels), Rowley D., and B. Black, D. Drost. 2010. Utah State University Cooperative Extension. Developing a System to Produce Organic Plug Transplants for Organic Strawberry Production. Paranjpe A.V. and D.J. Cantliffe, R. L. Koenig. 2004. University of Florida. High Tunnel Strawberry Production. Rowley D., and B. Black, D. Drost. 2010. Utah State University Cooperative Extension. Growing Raspberries and Strawberries in Containers, Demchak K. and M. Cooper. 2015-2016. Penn State Extension. Berried Treasures: Off-Season Production of Strawberries and Raspberries. Pritts M. Cornell University. Hydroponic Strawberry Information Website. (Production details, costs and economics) University of Arizona.